working closely with the owner architect of this new construction home, Gegg Design & Cabinetry made sure the kitchen would meet their request to simplify how they lived. The goal was to create a space that was functional and open with a modern feel. 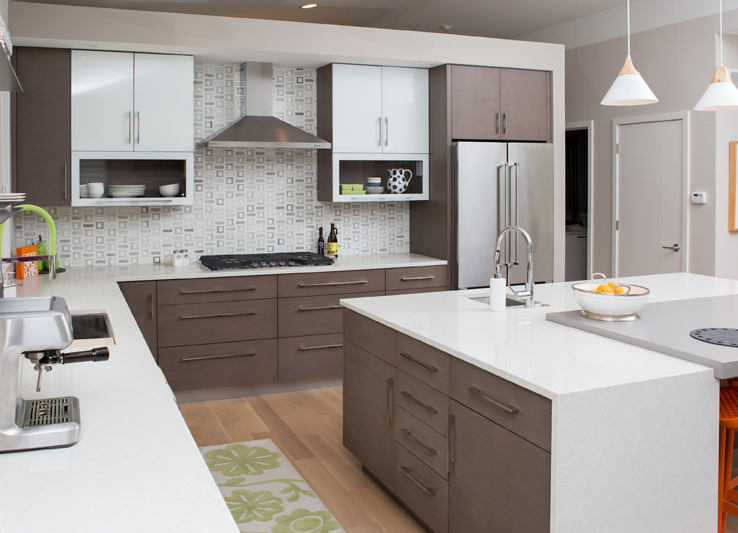 The cabinetry is horizontal-grain bamboo with a light-gray stained finish. The upper wall cabinets have glass-paneled doors that are painted white on the backside. The lower lift doors are only back painted on the perimeter to create an open glass cabinet. Stainless steel appliances complement the stainless-steel toe kick molding. The island features a full-size oven, small oven/microwave, prep sink and storage. The top is L-shaped with a waterfall on each end. The inside of the L features a slab of contrasting quartz counter that floats over the L-shaped portion of the island. The ceiling area slopes to an off-center ridge with a floating soffit over the cooktop. The cooktop wall does not go all the way to the ceiling to create an open feel to the office located directly behind the kitchen. Compact and fully functional, this kitchen has simple, clean lines and lots of natural light. The large windows make this a bright space. The designer was smart in tucking all of the appliances on the working side of the island. The decision to keep the soffit and the range wall from going all the way to the ceiling is a cool way to keep the space open.